The over-the-scope clip proctology system is rather new and information regarding its use for the closure of anorectal fistulas is scarce. No study has been designed to focus exclusively on its application in the treatment of rectovaginal fistulas. The aim of the study was to evaluate the feasibility, safety, and effectiveness of the clip for rectovaginal fistula repair. From September 2014 to November 2017, consecutive patients underwent a rectovaginal fistula repair using the over-the-scope clip proctology system and were enrolled in a non-randomized prospective monocentric study. The primary outcome was fistula healing at 8 months. Secondary outcomes included assessment of morbidity and timing of rectovaginal fistula recurrence. There were 16 patients with a median age of 40.1 years. The most common causes of rectovaginal fistula were adverse events following proctectomy or pelvic radiotherapy (6 patients), obstetric trauma (5 patients) and inflammatory bowel disease (3 patients). Most participants had undergone at least two previous surgical interventions before the clipping procedure. 11 patients had a temporary diverting stoma at time of the clipping procedure. Successful primary healing of the fistula was observed in 7 (43.7%) patients. Short-term complications were rare and included pain, which occurred in 4 patients, and spontaneous clip detachment, which occurred in 2 patients. Most recurrences appeared shortly after the procedure, with a median delay of 45 days (range 16–217). 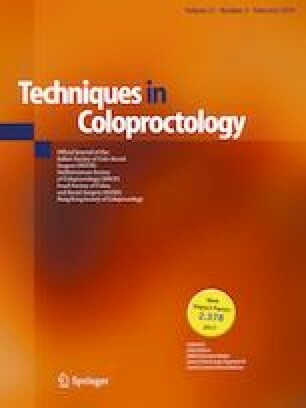 We demonstrated the feasibility, safety, and reproducibility of the Over-The-Scope Clip Proctology system in rectovaginal fistula repair for the patients selected. Further trials should be designed, incorporating comparisons to well-established techniques, a longer follow-up period, and a larger cohort. The authors thank Wolters Kluwer and Editage for language, grammar, and terminology checking. Jean-Luc Faucheron has a consulting agreement with AMI, Covidien, Medtronic, Ethicon, MSD, Legrand, and Johnson & Johnson Beauté Santé France. This has had no impact on the results of this study. Yiwei Tong, Bertrand Trilling, Pierre-Yves Sage, and Edouard Girard declare that they have no conflict of interest. The study has been performed in accordance with the ethical standards as laid down in the 1964 Declaration of Helsinki and its later amendments.